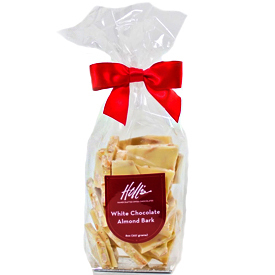 Delicious, freshly toasted vanilla-sugar almonds & pure Swiss white chocolate blend together to form this addictive confection. Net weight 8 ounces. Ingredients: White Chocolate (Sugar, Cocoa Butter, Whole Milk Powder, Skim Milk Powder, Soy Lecithin, Vanillin), Almonds, Sugar, Vanilla.